If it's something different you want in your buildings, you are in the right place today. Built in 1938 for a Brisbane dentist, Chateau Nous was designed by architect DFW Roberts and was considered ultra-modern (ie unusual) for the time. The Functionalist exterior and Art Deco interior would surely have had tongues wagging in the conservative up-market suburb of Ascot. The photograph below is from 1983. Original inclusions were servants' quarters and an electric dumb waiter to deliver food to an upstairs breakfast room. Later, a billiard room and a concrete air-raid shelter were added. New owners in 1986 added a tennis court and swimming pool, as well as a new master bedroom and ensuite, and undertook considerable remodelling of the kitchen and family room. Here is a current picture - the garden design prevented me from being able to repeat the original angle, and so this picture is from the southern side of the building rather than the eastern aspect as seen in the top photo. The last sale of the building mentioned in my usual sources was in 1994, and the price was in excess of $1.6 million. The house would be worth a whole lot more than that now. Edit: As at January 2011, this property is on the market. It will be interesting to see the purchase price. I lived in a large, white deco home like that until my marriage. 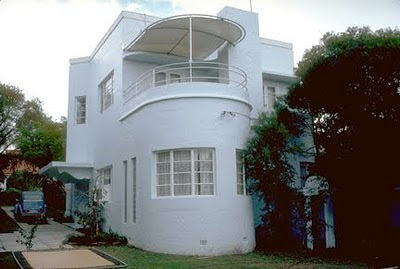 My family's (North Caulfield) was also built in the mid 1930s, with the same windows, verandas and decorative elements. It even had a billiard room, although no tennis court and swimming pool, alas. The only words that were even slightly surprising were "the Functionalist exterior and Art Deco interior would surely have had tongues wagging in the conservative up-market suburb of Ascot". The contrast with Californian bungalows, for example, would have been very starting. But I would have hoped that the most modernist trendoids of 1938 would have loved it.